The whole point of insurance is to protect your assets. You get homeowners insurance so that if something happens to your house you can recover and rebuild without it completely devastating you financially. In many cases, insurance is very straightforward. You purchase the policy, and you receive a benefit if something happens. It’s a little different with life insurance, since you buy the policy to benefit someone else. The point of life insurance is to insure your life so that the people who depend on you are protected in the event of your death. Since it is your life that is insured, you won’t collect any benefits, if there are benefits to be collected. Term life insurance works by covering you for only a set number of years. So if you have a policy that covers you for 20 years, as long as you keep paying your premiums, your family benefits if you die. When the 20 years is up, though, you no longer have coverage. Because coverage is limited by time, term life insurance is usually rather inexpensive. Whole life insurance doesn’t expire at the end of a set period of time. Instead, it covers you for your entire life span. However, it usually costs more than term life insurance. But it does sometimes build cash value, so if you decide later on that you don’t need the policy anymore, you can turn it in for payment (usually not what you put in for premiums, though). Often, it makes sense to base your life insurance coverage in an amount that can replace your income. That way, if you die (especially if you are the primary breadwinner), your family can afford to pay the bills. 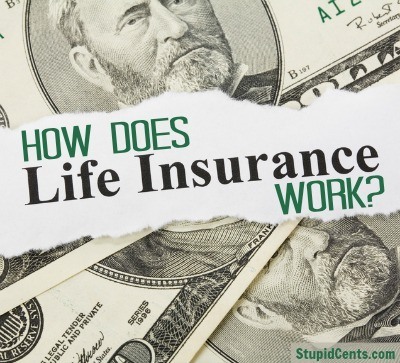 How Does Life Insurance Work for the Insurance Company? Because life insurance is usually part of a business, the company needs to make a profit. How does that work if people get policies of $500,000 or $1 million, or more? Well, the life insurance company makes its money by being good at determining probabilities. First of all, with term life insurance, there is a good chance that you will outlive the policy if you meet certain conditions. The life insurance company keeps that money, since no benefit is paid out. However, the insurance company doesn’t just keep your money in an account. Often, the money paid in premiums is invested. Not anything particularly risky, but also not in run of the mill savings accounts. That way, the insurance company can earn money. Over a lifetime, there is a chance that the money paid in premiums + the earnings from the investments, will cover the death benefit paid out (or even exceed it). In the end, it doesn’t matter a lot how the company makes its money. What really matters is that you buy a policy that can protect your family from financial ruin if you are unexpectedly taken from them.